When you’re looking to make someone smile, these happy face roses and statis is bottom. Sure to cheer up everyone from a beloved wife to a busy boss, these are also great flowers for kids. • Classic white roses combine with warm yellow with a little touch of pink roses and statis in a Styrofoam based basket. • Next Day Flower Delivery Available. 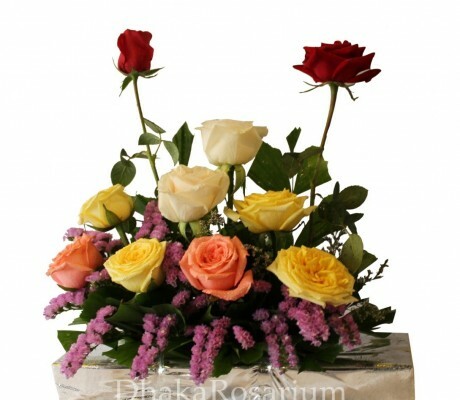 • This item is hand-arranged and delivered by a Dhaka Rosarium florist. • All prices in BDT Taka.